When it comes to improving your guitar tone, the first thing that probably comes to mind is getting a new amp, or a new guitar, or even some new pickups. The only problem with all of these solutions is they’re not only expensive, but sometimes unnecessary and time-consuming. 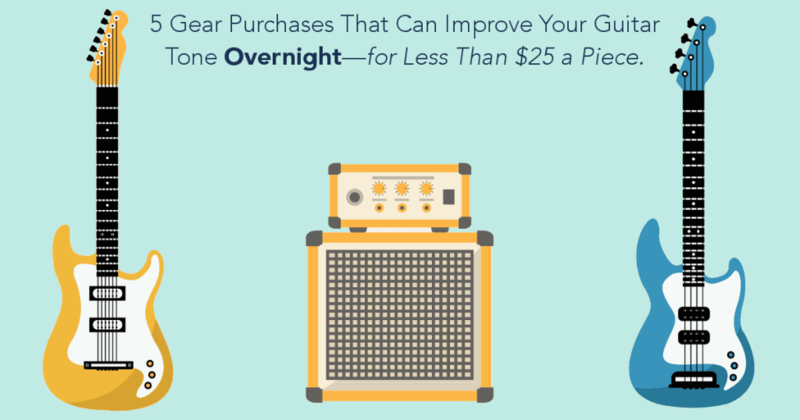 So we boiled down the top five gear purchases that can improve your guitar tone overnight for under $25 a piece—and in some cases, even less than that. Depending on where you are in your playing journey, some of these might be familiar while others might be new. Okay that’s enough of that, let’s get started! Having an awesome pedal board is just one of the things that makes playing guitar so much fun. After you’ve built your dream board of twenty different effects, you’ve got to figure out the best way to power all of them. Using daisy chains is by far the easiest solution, but in most cases it’s going to have a negative effect on your tone, making things a whole lot noisier. 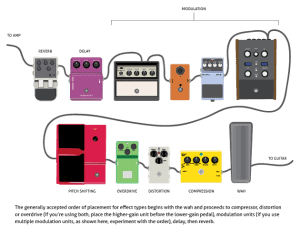 Pedals are made to be powered individually, not alongside a dozen other effects all being powered by the same source. Because of this, a lot of extra noise can be generated which will ultimately bring down the quality of your tone. There are lots of isolated power supplies out there that are a great long-term solution, but those options tend to get pretty pricey. The cheapest option for a player in a pinch (and with our $50 limit in mind) is to just run your pedals off of 9 volt batteries. Another bonus is not have to fool around with power cables and outlets, which we all know are in short supply at most gigs. There are tons of choices when it comes to picks. From shape, to materials, to thickness, the options are virtually endless. For starters, your classic-shape picks are a great all-around pick choice that are great for both lead and rhythm playing, but there are a number of other options worth considering. Bass and acoustic players can find a lot of tonal improvement with tri-tip picks because of the larger, easy-to-grip size and blunter tip that gives a warmer sound. If you want to speed up your playing, check out jazz or jumbo jazz pick shapes. 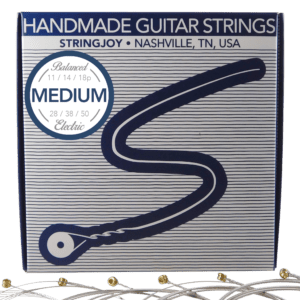 These are great if you need quick and nimble picking to really make those leads soar. Your most common materials are celluloid, acetal, and nylon. Celluloid picks have a very bright attack, but this can also be considered “flappy” to some ears, which can be off-putting to some players. Nylon picks are textured picks that have a bright attack and a more stiff than celluloid picks, but still have a good bit of flex. Our POM picks are made out of a highly durable, yet very porous material similar to acetal. 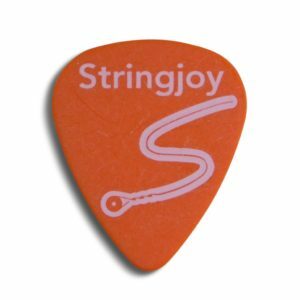 These are going to be stiffer than the nylon picks, but still offer a strong attack. Last, but certainly not least, we should talk about pick thickness. This can have a huge effect on how bright or warm your guitar sounds. In general, the thinner the pick, the brighter is sound, and the better for strumming. Also, the thicker your pick, the fuller your guitar will sound. While most guitarists favor one particular thickness, it’s worth taking a page from the session guitarists’ book and keeping a variety of pick shapes and thicknesses on hand for different parts, a thinner pick for acoustic strumming, and a thicker more pointed pick for heavier leads, for example. This just scratches the surface of picks, but if you want a bit more info check out this more in-depth guitar pick guide we made. Ultimately, as with all things, there’s no right solution for any given player, you just have to try different options until you find what works best for you. The differences in tone come about because of a thing called capacitance, or how clear and present the high-end frequencies will be. 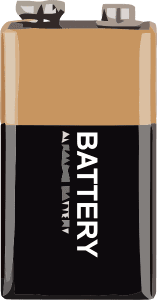 The lower the capacitance, the more defined those higher frequencies are. So if you’re using some cheap cable that has a very high capacitance, you’ll be losing a lot of presence that you would have if you were using a higher quality cable. Length can also play a big part in affecting your tone. Capacitance is measured per foot of guitar cable. Longer cables will have less of the clarity of a shorter cable. So while it might be nice to have those 100ft cables so you can run laps around the drummer during your solo, you aren’t doing your tone any favors. Ultimately, the best move for most players is to get a quality 10 or 15 ft cable to run from your guitar to your board, get some decent patch cables so you’re not losing a bunch of top end when your signal runs through your pedals, and use another quality, shorter cable to run from your board to your amp. Obviously this whole setup would exceed our $25 budget here, so if you’re starting small, just make sure any patch cables you use are of decent quality, and get a solid cable for the longest run in your chain. If you take care of it, a quality cable will be a good investment for years to come. I hope you don’t mind, but this one is actually special bonus, because you don’t even have to buy anything. All you have to do is get creative with how you use the gear you already have. The order of these pedals can have just about as much effect on your sound as the pedals themselves. Typically players will start with wah or compression, then dirt, EQ and modulation, and end with delay and reverb, but what if you started your chain with your delay pedal and your phaser came last? Some guitarists would rather die than have a delay be first in the signal chain, but it might just be the secret sauce that your tone sandwich needs. If you’re after a fuller, warmer, more powerful tone, one of the best and most cost-effective solutions is to go up a gauge in your strings . Going up in size will give you more output and that fuller bottom end you’re after. You’ll also be able to take advantage of increased sustain—and heavier strings tend to stay in tune a bit better than lighter ones. By all means, if you want to make a big jump from 9s to 10s, 10s to 11s, or 11s to 12s—have at it. But one of our favorite things moves is to go up a half gauge (yes, we’ve got those) from 9s to 9.5s, 10s to 10.5s, or 11s to 11.5s which is usually just enough to get a bit fuller sound, without sacrificing playability. We keep 9s on the Strat here in the Stringjoy office most of the time, but every so often we’ll mix things up with a 9.5 set and you can still bend to your heart’s content. Hop on over to our shop to see all the different gauges options we have in stock. If you want to change up your tone, you could drive down to your local music store and drop $1000 on a new amp, or you could try these easy techniques to give your sound that extra boost that it might need, all for less than the price of a dinner for two.